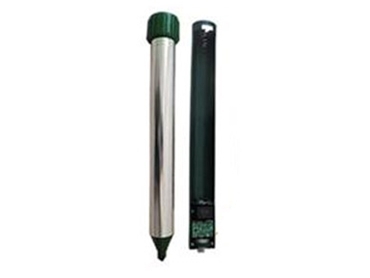 The AN-312-V battery powered snake repellers are exclusively available from Enviro Bug Control . The battery powered snake repellers eliminate the need to rely on solar power to get protection in dark and shaded areas such as under houses and inside dirt floor sheds, stables, pens or poultry barns. The snake repeller can even be taken on camping trips. The powerful 4 x D cell battery powered waterproof snake repeller has a vibration range of 30 metres diameter and will operate continuously for up to six months with good quality batteries. It works by emitting an intermittent combination of sound and vibration with the sound waves irritating the snakes, simulating danger, and causing them to move away from the protected area. AN-312-V battery powered snake repellers are also ideal for outdoor gardens, nurseries, lawns and areas subject to flooding. A battery slide holder is included so that batteries can be changed without pulling out the stem. The repeller emits a sound wave every 30 seconds and lasts for 3 seconds. Compared to other battery powered snake repellers, the EBC snake repeller is in a definite class of its own. Constructed from high quality materials to meet Australian standards, the snake repellers employ a combination of ultrasonic sound and an intelligent microcomputer chip board with a unique extra powerful, vibration motor to keep snakes out without upsetting common household pets. The waterproof construction also delivers years of reliable service in harsh outdoor conditions. AN-312-V battery powered snake repellers are backed by a 12-month return and replacement warranty, excluding any physical damage.